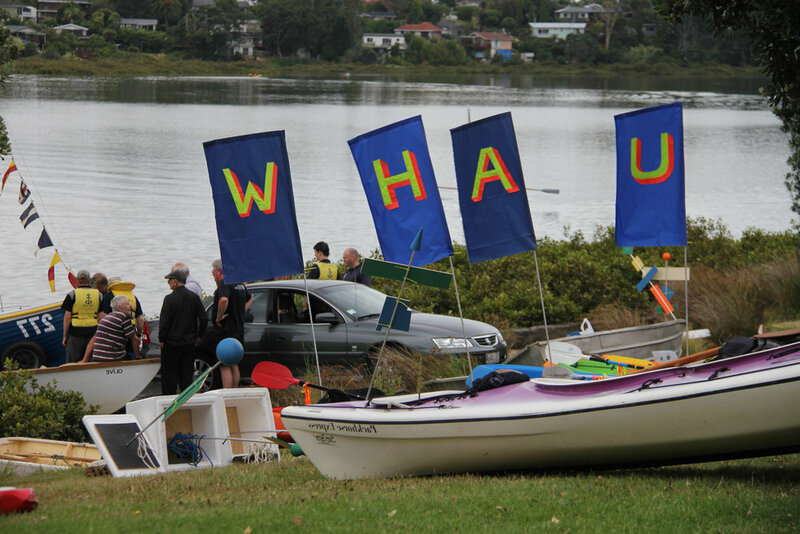 The Flotilla Whau is an annual parade-like spectacle on Te Whau River, drawing attention to an important yet overlooked waterway and making opportunities for people to experience their local river. Since 2013, on a day in late summer when the tide is in, HOOP-LA facilitate a horde of people to take to the water in a melange of craft. The first Flotilla Whau was intended as a one-off, a fleeting spectacle to draw attention to Te Whau river, that sits concealed behind factories and warehouses, below a road transport-oriented horizon. Initially developed by HOOP-LA for the Rosebank Art Walk, this first flotilla was mainly a spectator event, with only a small group of boats taking to the river, following a course marked by a series of signal flags, mapping out long-gone sites of riverside production. Since then, through subsequent annual iterations, the Flotilla Whau has grown in size with up to 200 people out on the water. All are welcome, so long as the craft is seaworthy, adequate ‘flotation devices’ are provided and speed is kept to five knots! The Flotilla Whau instigates a temporal engagement with the Whau River and operates as both artwork and community event. Producing a memorable image of the potential of the waterway, evoking both past and future conditions, the event brings Whau users together, stimulating connection and on-going discussion. The Whau Local Board, New Lynn Sea Scouts, the New Zealand Maritime Museum, Whau the People and Martin Ball. Photos by Brian Marsom.